Here is a look into our defensive line slants “Razor” & “Laser”. 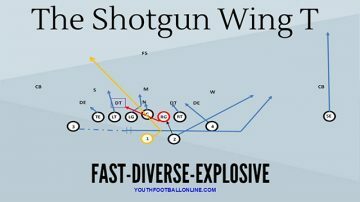 We run a 3-5-3 stack defense so we do a ton of blitzing and slanting. We often send our Dogs (D-OLBs) off of the edge and we slant our defensive line a different direction every single play. However, there are times when we know where the play is going so we will slant to that side. On “Razor”, our defensive line slants one gap to the right and on “Laser”, our defensive linemen slant one gap to the left. N: Slants to the right, has A-gap responsibility. DT (right): Slants to the right, has C-gap responsibility. DT (left): Slants to the right, has B-gap responsibility. D (right): Force player, must maintain outside leverage. D (left): Back-side (away from slant) force player, must maintain outside leverage. M: Read step, backside A-gap, then pursuit. R: Read step, slant side B-gap, then pursuit. L: Read Step, backside C-gap, then pursuit with backside angles/leverage. N: Slants to the left, has A-gap responsibility. DT (right): Slants to the left, has B-gap responsibility. DT (left): Slants to the left, has C-gap responsibility. D (right): Back-side (away from slant) force player, must maintain outside leverage. D (left): Force player, must maintain outside leverage. R: Read Step, backside C-gap, then pursuit with backside angles/leverage. L: Read step, slant side B-gap, then pursuit. Slanting defensive linemen need to dip and rip to reduce their blocking surface (surface that OL can get their hands on you). When the DL dips and rips, they must maintain their gap responsibility. They cannot slant themselves out of the play or get washed by offensive linemen. They need to hold their ground. Attack on ball movement, violent hands. Attack! Attack! Attack! 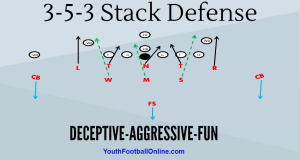 Linebackers must take their read steps. You they cannot overflow to the slant side because that will create cut back lanes. Scout your opponent! When you know where they are going to run the ball, slant that way! However, don’t just guess, scout and breakdown the opponent’s film! Slanting defensive linemen tend to slant themselves out of the play, leaving massive cutback lanes. It’s critical that you teach your kids to dip and rip, while maintaining their gap responsibility. Linebacker will tend to overflow to the slant side for some reason. They need to understand that every defender has a gap and they must read step to make sure there are no running threats to their gap before they fly to the football. One read step, then attack. Try not to guess very much. For example, if you call “Razor” and they run or execute a counter play to the left you could be in trouble. Don’t slant your defensive linemen out of the play. Scouting is critical.